A great spot on the web to find new info, tips and products for x-ray scaling and orthopedic templating. Which Orthopedic Surgeons are using Akucals to scale their x-rays for digital templating? Over 6000 facilities worldwide. Who buys Akucals? People that want quality, even if it means importing. Size matters. Scale your x-ray. 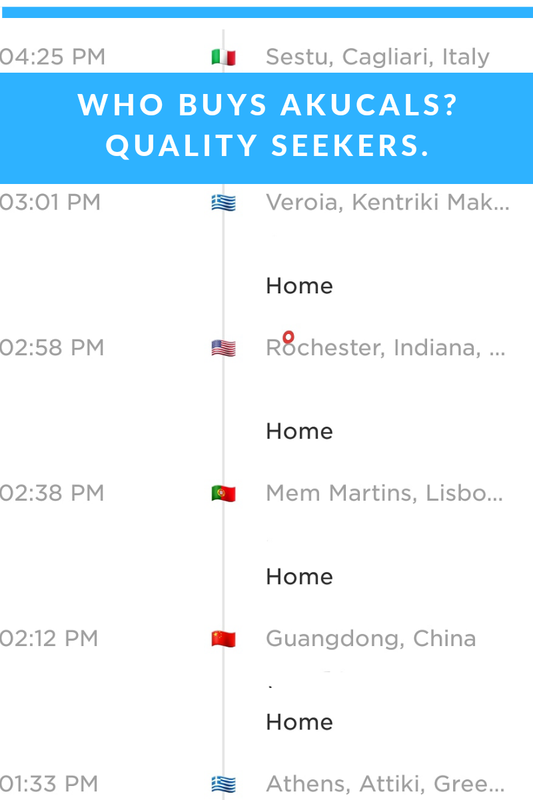 Demand quality. Trust in Orthopedics is mandatory for results. Do you trust your X-ray? "Hey! We are chartering a bird into the back country of Canada to fish. Do you think an Akucal will make it there and back suctioned to the plane?!" WELL THE COW CAME HOME! It's all about trust. Trust breeds results. And we are all about results. SIZE MATTERS. SCALE YOUR X-RAY. Akucal awareness. Showing Orthopedic Surgeons what their x-rays will look like with our J2 magnification marker. We imposed an image of an Akucal scaling marker to show how easy it is to know the true size of anatomy. We feel it's an injustice for images to remain unscaled. Size matters. Scale your x-ray. Akucal... A legend for the map of x-ray. 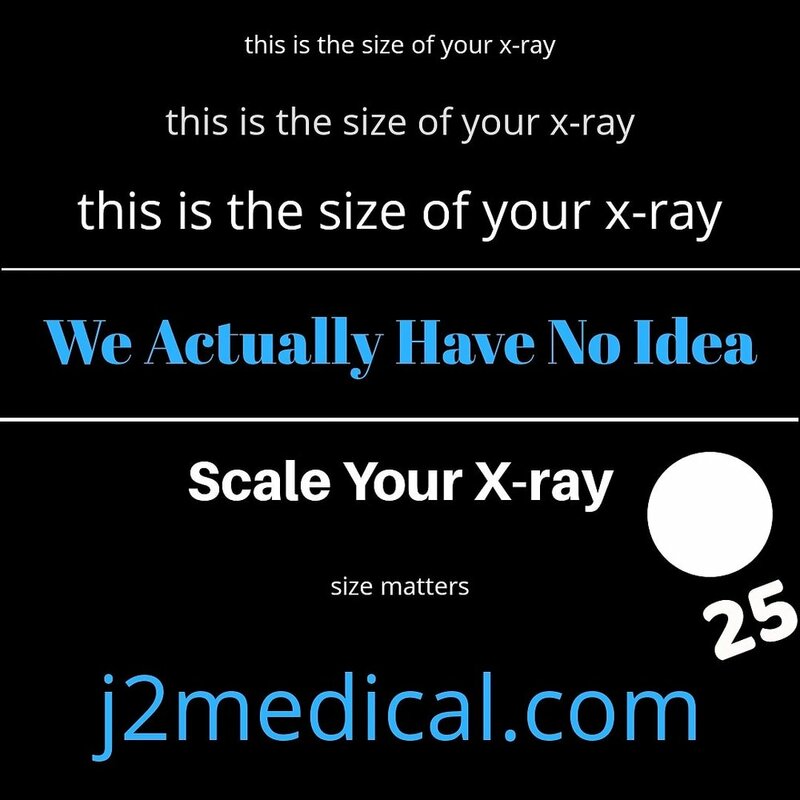 J2 Medical puts the legend on the map of x-ray so you know the actual size of it's contents. An Akucal is used by the best Orthopedic Surgeons to presurgical plan their procedure when accuracy is a must. This is the size of what's in your x-ray. Actually, we don't know. Scale your x-ray and know for sure. 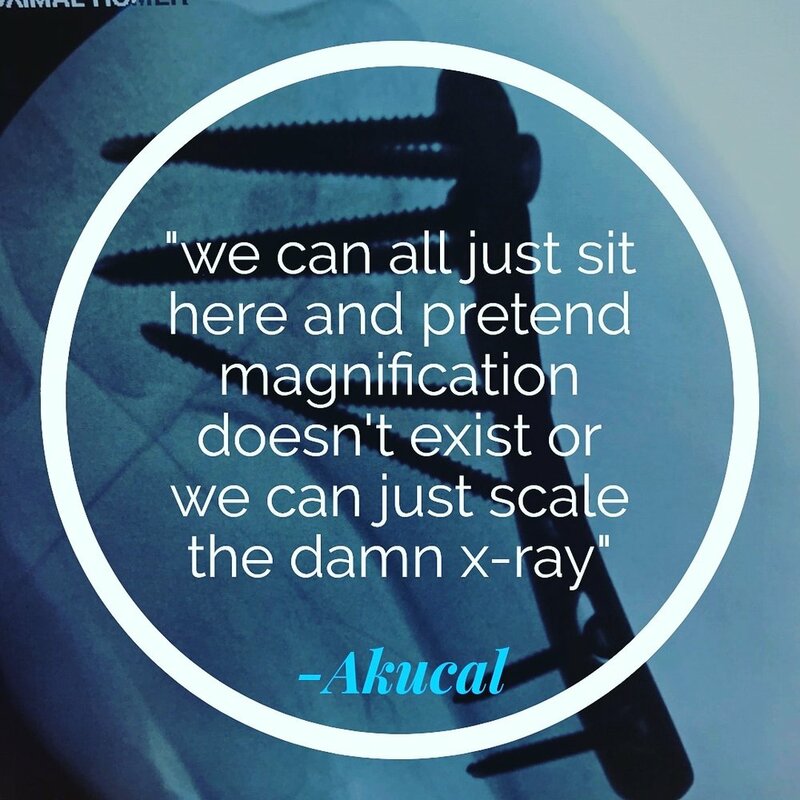 Scaling an x-ray with an Akucal from J2MEDICAL gives you insight on how much magnification is present in the image. Otherwise, it's impossible to know until it's too late. 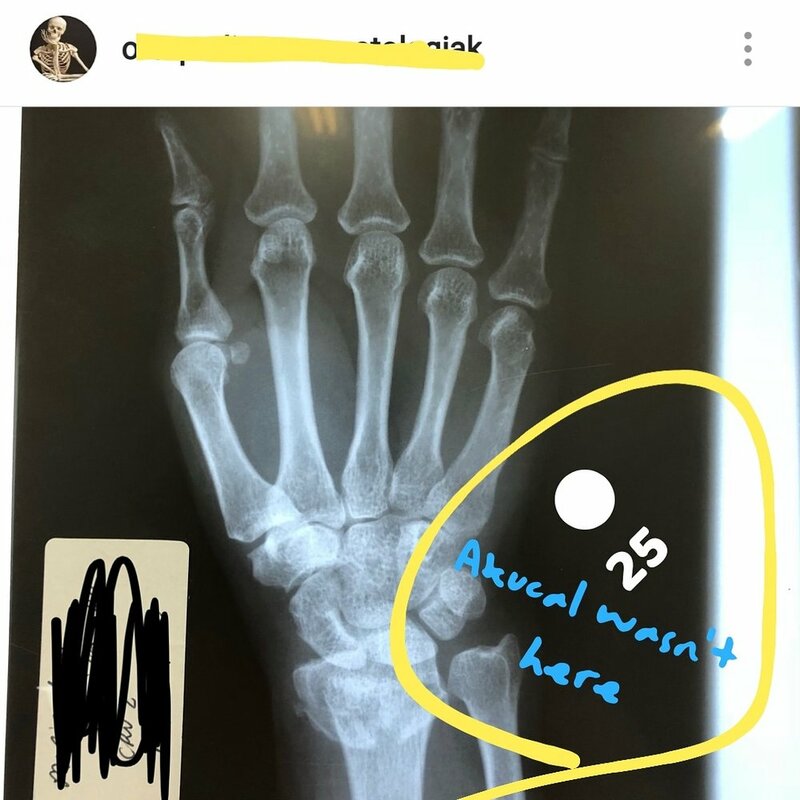 Use an Akucal at the time of aquisition, and know the actual size of whats in an x-ray. Visit j2medical on the web and do this today. X-ray scaling needs in high demand? Get an Akucal FaTpAk 8 room kit!!! When your x-ray scaling needs are in high demand, we offer "paks" so rad techs don't have to fight over their favorite product. Buy more. Have more. Scale more. SIZE MATTERS. Take charge of your x-ray imaging. Set yourself up for success. I wish we could do it for you but we can't. What we can do is make the best products and stay true to our word. You have to take initiative for success and we've made it very easy. Fill out the form on our website or give us a call and we'll get started. Do you trust what you see? You shouldn't and this is why. The divergent beam of an x-ray makes the anatomy appear larger because the patient is positioned between the tube and the receptor. This is called magnification and it's present in every image. The average "mag factor" of a study is from 9 to 29 percent and our community accepts this for the most part. J2 Medical has been scaling x-rays for the better part of a decade and we've made incredible strides with Orthopedic Surgeons. Orthopeadic templating helped further expose this major flaw in radiography because magnification is obvious when you are in a joint replacement surgery and none of the templating measurments seem to add up. This directly equates to time and money and is the easiest way to achieve better end results before templating even takes place. So now that you know, it's time to let an Akucal from J2 Medical make a huge difference in your daily routine, your effectiveness and your bottom line. Contact us today and let us get you started! We have a passion for customer service and design! The two go hand in hand and it shows! The Akucal is 100% custom designed and manufactured precisely for your needs. It takes hours of metal sculpting on multiple machines before it's sent to anodizing, laser etching, assembly and testing! We get it. It's the elephant in the room... this whole magnification topic. But in reality, you wouldn't accept this amount of deception in anything you bought into. Try an Akucal scaling tool. Know the magnification of the image. Make more informed decisions. Get better results. The pros have been using it for over a decade and the secret is out. An x-ray is a map of the anatomy. An Akucal is the legend on that map. 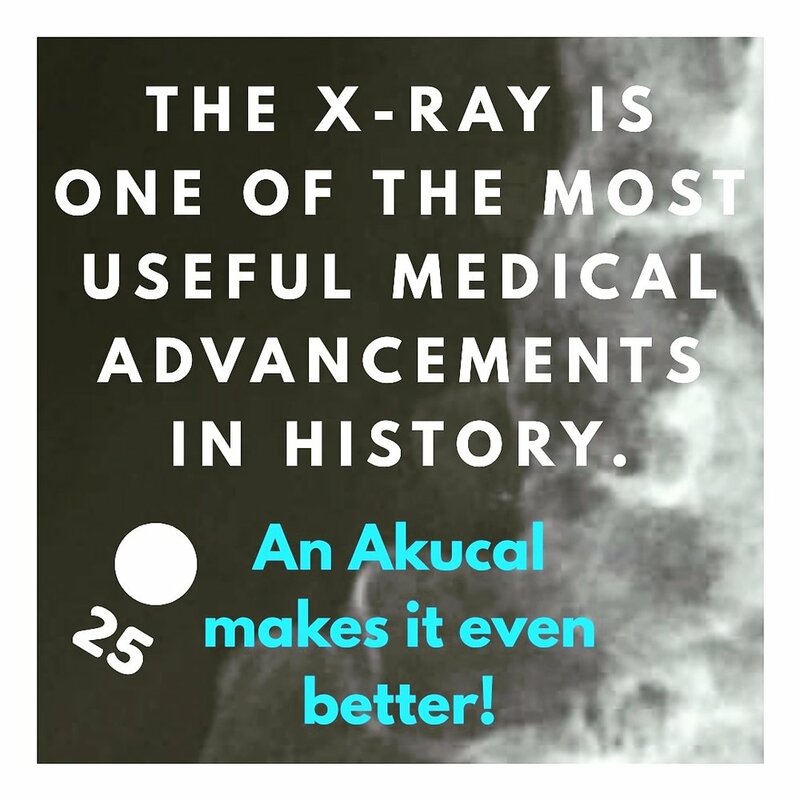 If an x-ray is a map of the body, an Akucal marker is the legend. And every map needs a legend. Truly legendary and with 10 yrs of worldly excellence and Professional Designer quality to match, it's a win. Radiography and size discrepancy. What you see is not what you get! Patient size, positioning, and a divergent beam, bamboozle the size of your x-ray. The Akucal has been developed over the past decade with the feedback of the most cutting edge Orthopedic Facilities. Give one a try and Have A Nice X-ray... and possibly leave work early on Friday 🏌️‍♀️🏄‍♀️⛳ Spread the word!